Music rarely jumps at you, grabs you by the throat, and simply refuses to let go. This is however one of those moments when the blues goes straight at the jugular and if the poor listeners are too slow to react? tough luck as you could easily end up on the floor, face down in a pool of blood. A too vivid description and really way over the top? 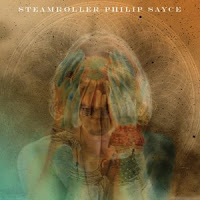 Yeah, Philip Sayce is hardly out on a mission to annihilate his entire fanbase rather than expanding it by releasing his most exciting solo effort so far. The first five tracks off "Steamroller" are simply magical. The former Jeff Healey Band and Uncle Cracker guitarist are coming up with licks and tricks of highest intense and order. The opening title-track will have you thinking about Jimi Hendrix and some might say it's Lenny Kravitz as they hear "Stung By A Woman". Probably the best hit he never had for that matter. However, there's more to Sayce than first meet the eye/ear. It goes all the way back to the U.K. blues/rock guitarists of the late sixties and even further back to the roadhouses of America and the original blues musicians. The notes and tones are right on the money and the songs literally feels alive and kicking throughout the album. For instance, "Black Train"- I'm not quite sure about the line-up regarding the rhythm section (bass player, drummer) and no, I can't be arsed to google. However, try and imagine if Geezer and Bill Ward (Black Sabbath) would be in their twenties again and you're darn close to home. Extremely groovy, almost jazzy, and heavy as funk. Sayce is playing the devil here as he sits on the fence with one leg on each side of the hard rock and blues. He's quite the remarkable vocalist too with lots of soul and attitude. Have a go at the soulful ballad, "Marigold", and you'll notice the top-notch quality of his vocals. Steamroller is one of the best albums of 2012 by far! I remember when I first heard the title track I described him as a blonde Lenny Kravitz but when I kept on listening and then got his previous albums I realised I had discovered a jewel of heavy blues rock. Philip Sayce is an extremely talented guitar player and an amazing singer. I highly recommend his work to anyone who's into blues rock or simply good contemporary electric music.